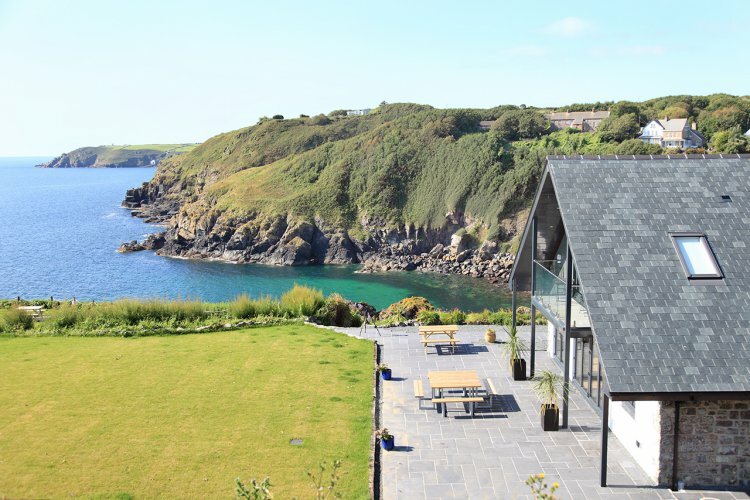 This is a truly stunning location, Cadgwith is well known for its thatched cottages and working fishing boats pulled up high on the shingle beach. You can even buy fish and shell fish from the Cove as soon as the boats return - it doesn't get any fresher! Discounts for parties of 5 or less are available - please phone to ask! Bodrigy is the last property along a smooth unmade track and as such there is no passing traffic. The grounds are extensive though children should be supervised as it's steep in places. The South West Coastal footpath passes just under the house and offers miles of coastal walking in either direction. The views are truly stunning and available from the living area as well as 4 of the bedrooms. Overlooking the cove you can watch the boats come and go. Further out along the coast, south westerly to Lizard Point, there's a sunset every night and finally right round and out to sea. There is even a newly cleared and created seated viewing gallery at the rear of the property just to catch the later sunshine and those late afternoon views over the sea and village. Recently added: A 9.5m Boule Court, situated right on the cliff edge with the sea on two sides. Two sets provided along with instructions. Completely refurbished to a very high standard throughout. 5 First floor bedrooms including 4 en suite and one separate bathroom including a bath. 1 Ground floor bedroom with wide access for a wheel chair, ensuite double sized shower room. Balcony from the master suite with table and chairs to enjoy breath taking 180 degree sea and village views. Games room / kids lounge with pool table, darts and table football. Good selection of games (both outdoor and indoor) DVDs, Puzzles and books. Ground floor cloak-room with toilet. LCD TVs in kitchen and games room as well as the lounge and small TV in downstairs bedroom. Very large ground floor with open-plan living/dining and kitchen areas. Wooden floors throughout the ground level with under-floor heating. 2 minutes walk from the heart of village. Utility room with two washing machines and tumble dryer and second dishwasher. Extensive grounds with a variety of seating/relaxation areas, all with sea and village views. Brand New brick and stone built double BBQ - starter pack of firelighters and charcoal provided. Brand new 'Boules' lawn overlooking the cove. Extended Parking and turning area for 10 cars. Rental includes bedlinen, towels (beach towels provided free upon request), electricity, central heating and Wifi. Bodrigy will accept up to two well-behaved dogs by prior arrangement for a charge. Dogs are restricted to the ground floor only. Please note that guests are required to pay a £200 security deposit to the agency at least 1 week prior to arrival, please see Ts &Cs. All of our properties operate a strict No Smoking policy.